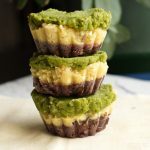 These matcha chocolate turmeric cups (MCT cups) are a play on MCT oil, but give you a boost of superfoods in every bite! Who has heard of the latest trend of MCT oil? MCT’s are medium-chain triglycerides that are claimed to have numerous health benefits, such as helping to raise the metabolic function, making you feel more full, having more energy, thinking more clearly etc. Coconut oil is a great source for these MCT’s but recently there has been an increase in use of concentrated MCT oil, especially in the ketogenic diet. While I’m not on the ketogenic diet, I have experienced some assistance in my hormone levels and digestive functions when I include some of these oils in my diet. Often I will have a teaspoon of MCT oil when I am having digestive issues (not to go into too much information) and find relief quite quickly afterwards. A word of warning – don’t have too much MCT oil to begin with, or your stomach will hate you! 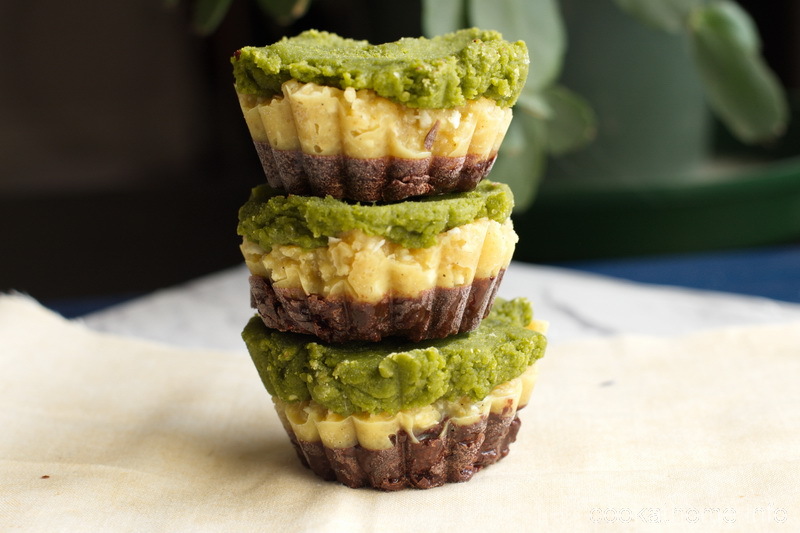 Anyway, lets get back to these yummy matcha chocolate turmeric cups. Did you see what I did there with the name of the recipe (matcha chocolate turmeric = MCT)? So I’ve called these MCT cups, but you can use either coconut oil or MCT oil in them – it’s your choice! Now you’ve already discovered my fondness of matcha in this chocolate matcha slice, and in this matcha latte, so you shouldn’t be surprised that I continued to combine matcha with more baked goods … And you should also remember my love of Pranayums so really, this recipe shouldn’t surprise anyone. Now, if you don’t have a stash of Pranayums on hand, just use turmeric, but I love the additional spices that the Pranayums shots give you as well! I also have made this with some stock-standard honey, maple syrup and raw honey, and I gotta say that I much prefer the raw honey option, but all of these are great. These cups went through a few different versions, with even my yoga instructor asked to taste test. By the way, she was the one who suggested coconut in the turmeric layer and I totally loved it! So really, these matcha chocolate turmeric cups are a superfood in a bite size. So you should try them. And let me know what you think!